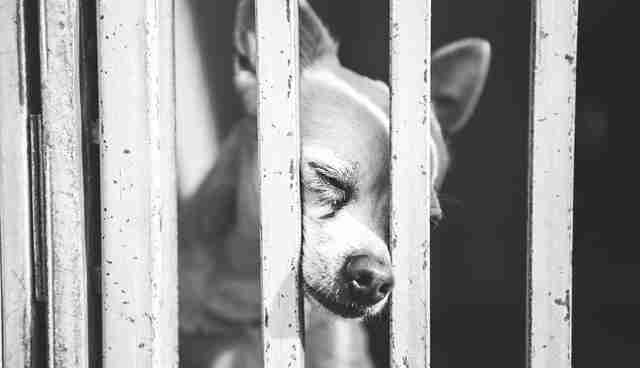 Shelters can be the first step on a dog's journey to a new home - but for so many dogs, the wait is almost unbearable. A 2-year-old Chihuahua was found wandering around a McDonald's parking lot in California, running in the path of cars. Many people tried to catch the little guy to no avail. When an animal control officer arrived to help, he was having trouble, too, and it looked as if the dog would never be caught. A concerned passerby, Rose Gallardo, saw the dog running away from the officer and decided to try and help. "The officer was trying to catch him by feeding him, but the dog was too smart and kept running through the parking lot," Gallardo told The Dodo. She got out of her car, knelt down near the dog and held out her hand - and somehow got him to come over and let her pet him. Everyone, even the animal control officer, was shocked that after trying all day to rescue the dog, Gallardo was able to do it in no time at all. "He was amazed at how the dog was so submissive to me when no one else could catch him," Gallardo said. "He was and is the sweetest, most precious baby." It seems all the little dog really needed was someone to calmly let him know that they were on his side. 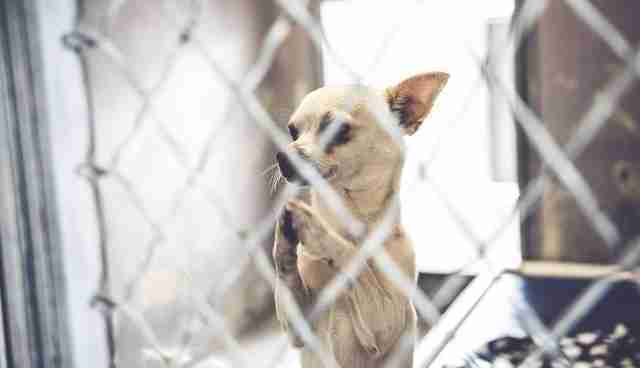 Now, the homeless Chihuahua is at the Baldwin Park Animal Shelter, and even though he is safe from the dangers of that parking lot, his struggle is far from over. 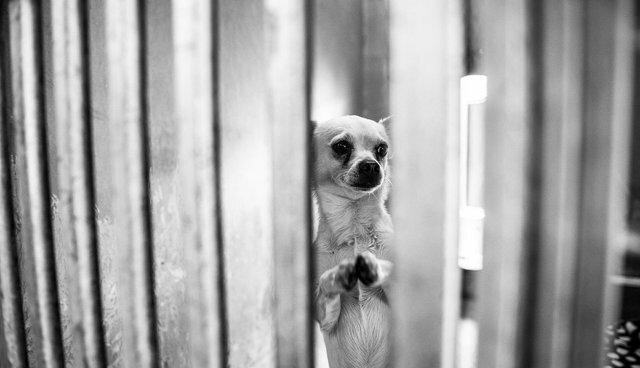 Local photographer John Hwang, who often photographs shelter pets in need, heard about the little Chihuahua and went to visit him at the shelter - where he jumped up against the bars of his cell and put his paws together, almost as if begging for someone to help him. "He stood on his hind legs and clasped his front paws together. 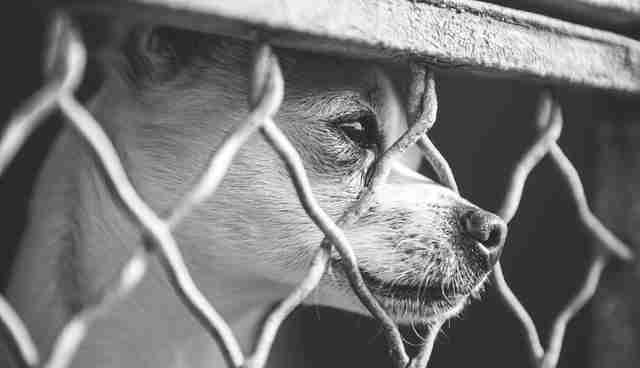 Up and down, up and down, he shook his paws towards anyone that came by, as if pleading, begging for his freedom," Hwang wrote in a Facebook post. The sweet dog clearly knows that he does not belong in a cage, or a parking lot. He wants a loving home, and isn't afraid to ask anyone who passes by. The little guy is still so young, and deserves a loving home where he can grow and play. This adorable dog will be available for adoption from the Baldwin Park Animal Shelter starting on January 14. If you would be interested in adopting him, you can contact the shelter at (626) 962-3577. His animal ID number is A4910211. If you'd like to add another pet to your family, you can check out Adopt-a-Pet.com to get the process started.